Snow in the west country, well any where in Alberta this year, continues to accumulate. The snow is the deepest I have seen in many years, in the range that the wild horses call home. So far this year, there have been no great chinook winds to lessen the snow pack and clear the hilltops and side hills. As I have travelled the back country with Fran, we were having trouble finding the horses in their normal wintering areas. I was worried a bit about where they may have gone too or what may have happened to them. In the last trip out there on January16, I began to see a pattern where the wild horses were ranging. As we stood on a hill glassing the landscape, we started to see the horses down below in the big muskeg meadows, instead of the older clearcuts and aspen meadows where the snow is very deep and drifted in quite a bit. 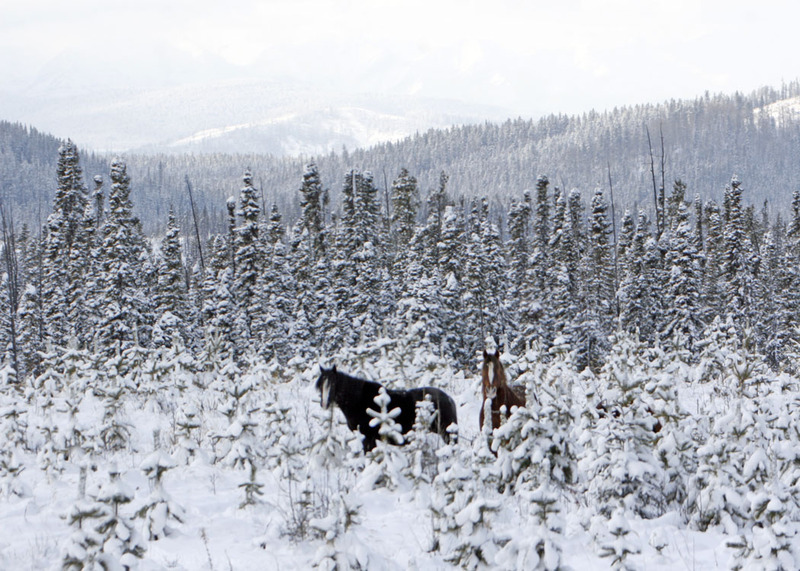 Usually the wild horses only use these muskeg valleys to pass through in winter. In summer they are too dangerous and full of annoying insects for the wild horses. However this year this is where a majority of the herds are finding their forage. The grasses in the muskeg area are a lot coarser and lower in protein than they are use to, but it is very abundant and easier for them to paw out. It also gives them the bulk that they need to keep warm in this weather. As the wild horses do paw out their feed, I have noticed the deer following them way out into these large open meadows to feed along side them. 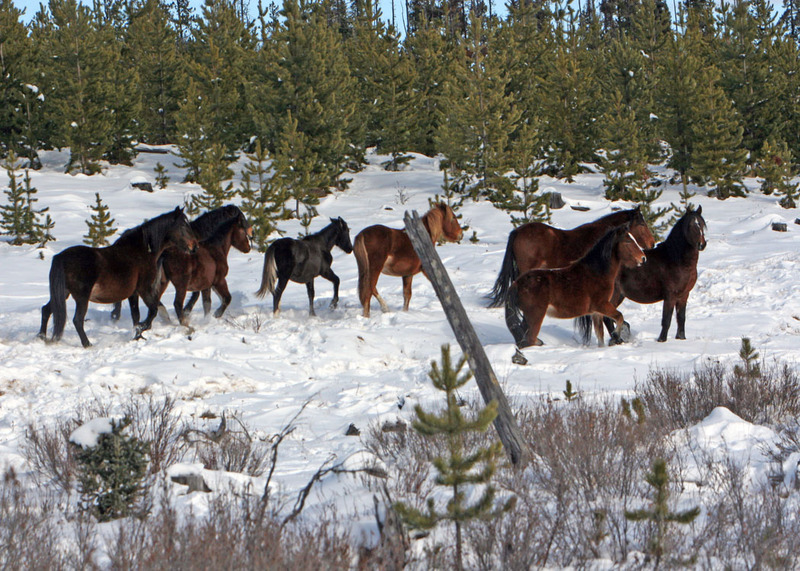 This showed me that the horses can quickly adapt to their enviromental conditions to survive a winter such as we are experiencing this year in Alberta and are an intregal part of the ecosystem. Fran is an experienced cross country skier and I have no experience at all. Working on this idea, we decided it would be a great way to get in shape and find wild horses. This last trip in the vehicle confirmed that this may be a good idea. Now I must tell you now that in driving around with Fran I have managed to get us into some predicaments and the dash on her side of the vehicle suffered. A couple of weeks ago she convinced me to buy a set of cross country ski equipment so that we could tour wild horse country photographing them this way. Having done this, I decided I should try out this stuff first by myself so that no one would laugh at my awkwardness. Here is my story of my first attempt at trying this equipment. On the weekend in the search for adventure I had Fran talk me into buying a full set of cross-country skiing equipment. Silly man!!!!!! Question? Is she secretly trying to get me back for endangering her life with my driving? Took my first attempt at it tonight over at the horse pasture. That way no one would see me as I attempted what I thought would be an exciting and fun pastime. As I learned quickly, I do not learn quickly any physical activities. 7:15 PM – arrived at pasture with my dogs. My new boots fit really well and I managed to engage them in the binding’s first try. This is good and it is going to be easy I thought to myself. I then began to trek down the horse pasture with my trusty dogs beside me. Point: Do not have dogs on long rope lead and make sure it is not around your leg when you let it go. As they went running off I felt the tug of the rope and then saw stars even though it was cloudy. Managed to get on my feet again and undid the rope off the dogs and off I go again. I was making great strides in this first attempt. Really it was only about five or six before the dogs came roaring back to me. Point: Got to learn to keep dogs away from me slightly. As I kept trying I faced several challenges – bowled over by dogs three times, nope, make it four, tripped over my own skis three times. Point: Pay attention and stay away, again, from frozen horse droppings. Finally made it back to fence and vehicle. Learned one other thing at this time. Point: Take skis off before trying to go over barb wire fence. This time the stars were really pretty though. Point: Buy new jeans and bandages for home. Point: Legs are still attached to my body, I just cannot feel them right now. Point: When at doctors tomorrow getting pain killers and muscle relaxants, see if there is a quick check for mental stability because I am thinking now that I may crazy. Point: Keep Absorbine Horse Liniment away from vital organs on body because it burns. That is not a tan down there. Point: Hide skis and fain illness this next weekend by then I may be able to feel my legs again and red marks on face may have gone away. Gee, those stars are still pretty. 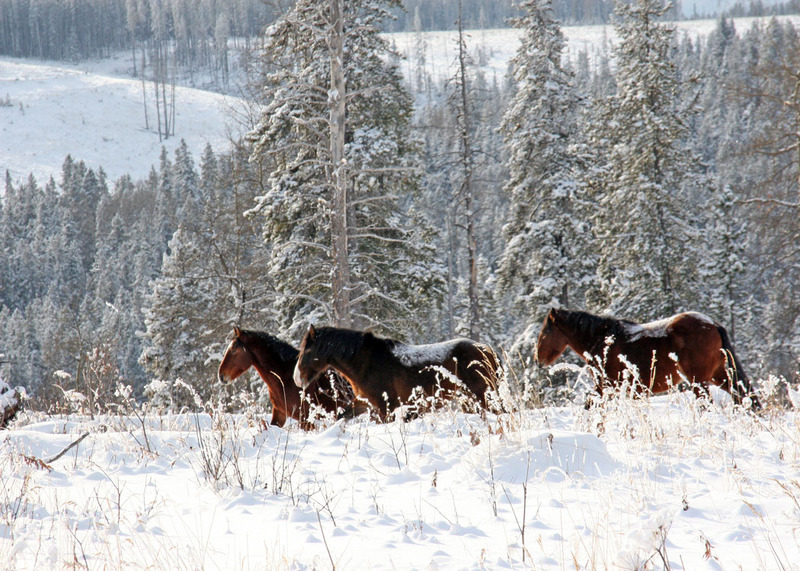 It will be interesting to see how the horses far back in the muskeg meadows accept two strange beings on skiis back in their country. Hopefully I will be able to get some good photographs close up as to how the horses are enduring this winter If I do survive I will post a follow-up on their condition and what we observe in this new type of adventure.